I need a Ruffled intervention. A Rufflevention? Am I engaged? No. Am I anywhere near being engaged? Not really. Am I some sort of wedding planner? God, I wish. Even with the facts being what they are, I am infatuated with weddings. I love them. I don’t even have to know you and I probably think your wedding is super rad. You know what else I love? Anything homemade. You made your own flower arrangements? And sewed the bunting for the chuppah that your great-grandfather built with his bare hands? Oh and hey, you and your bridesmaids baked 400 red velvet cupcakes for the reception? YES, I WANT TO BE BEST FRIENDS. So, back to Ruffled. Ruffled is a wedding blog that features beautiful weddings, as well as inspiration for the big day, DIY ideas and even a Recycle Your Wedding section where readers can sell anything from bridesmaids dresses and wedding gowns, to table settings and photo booth props. 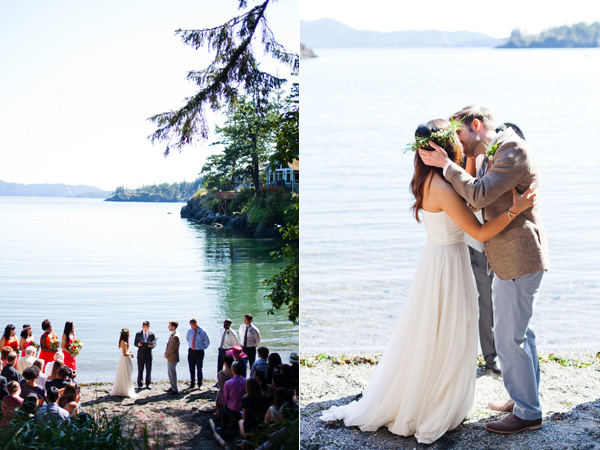 While skimming a few posts over breakfast, I found Stacy and Teal’s waterside Washington wedding. It’s bananas how beautiful it is. Her dress, the location, the decor, the fact that they look absolutely over the moon for each other; all of it. It’s gorgeous. photo credit: Mastin Studio <—check that dude out. be careful not to drool on the keyboard.